In today’s startup headlines, Startup Canada wraps up its Nova Scotia tour, CATA applauds the U.S. crowdfunding bill, and Toronto’s Hashcaster helps optimize Twitter for live events. Over 500 people have attended Startup Canada events in NovaScotia for the kickoff leg of the group’s cross country tour. The tourstarted in Halifax on March 19 before moving on to Truro, Antigonish,Yarmouth, Sydney and then Halifax again on March 23. Localentrepreneurs got the chance to sit down with east coast businessexperts during 50 one-on-one interviews. 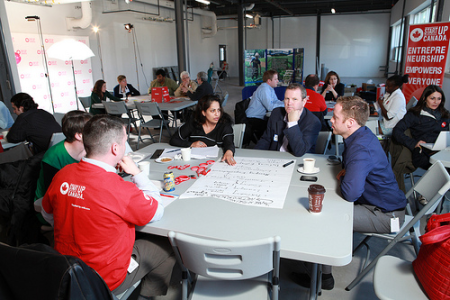 Key areas of support neededfor Nova Scotia entrepreneurs were identified through the events,including better enterprise support, greater awareness and learningopportunities for entrepreneurial youth, more entrepreneurialmentoring, and more virtual and physical spaces for entrepreneurialcollaboration. A Startup Canada event heldrecently in Truro, N.S. The next stop in the six-month 30-city tour is PEI from May 8 to 10. Awhite paper of recommendations for startup support initiatives will bewritten after the tour ends and presented to Prime Minister StephenHarper this fall. TheCanadian Advanced Technology Alliance (CATA) issued a statementexclusively to ITBusiness.ca reacting to the recent passage ofcrowdfunding legislation in the U.S., which allows startup firms todirectly solicit equity financing from consumers over the Internet. Thepractice formerly required the cumbersome, expensive process of filinga prospectus with the U.S. Securities and Exchange Commission. On May 24 Sherwood Neisse, one of the most outspoken advocates forcrowdfunding in the U.S., will speak about the movement at an i-Canadaevent in the Toronto area (exact event details have not been releasedyet). CATA has expressed concern thatCanadian tech startups will fall further behind their U.S. counterpartsin landing financing unless Canada also legalizes crowdfunding. Hashcaster, a Toronto startup whose platform helps event organizersoptimizeTwitter for live events, is profiled today by TechVibes. CATA, crowdfunding, legislation, Nova Scotia, startup canada, startup roundup, u.s.